A highly decorated soldier in the US Army, General James A. Van Fleet was the third owner of Dominion Hill. He visited the property as often as he could during the summer months, and his family vacationed there alone when he was deployed overseas, as a senior commander of US and UN troops. James A. Van Fleet was the third generation in his family to provide military service to his country. His grandfather, Joshua Jan Van Fleet, served in the Revolutionary War, joining the New York Militia in 1779. His father, William Van Fleet, served in the Union Army during the Civil War and was friends with Abraham Lincoln. Clearly, patriotism and military service were in the blood of this four-star general in the US Army who served his country for 37 years and earned more than 20 medals, including (among others) the Distinguished Service Cross, the Distinguished Service Medal, the Silver Star, the Bronze Star, and the Purple Heart. Van Fleet was not afraid to create controversy by speaking his mind, even when he disagreed with decisions made by those in power. 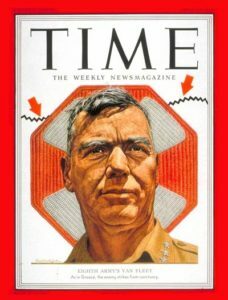 As reported in the New York Times, “General Van Fleet caused a stir in the closing days of the Korean War when he told Congress that he had been held back from fully pursuing the Communist forces.” Had he been allowed to proceed, he was confident that North and South Korea could have been united. Van Fleet expressed his opinions, and stood up for what he believed. During the Korean War he fell in love with the Korean people and referred to Korea as his “second home”. His departing words to the people of Seoul in 1953 were, “I shall not ask you to give me back my heart; I leave it with you” (3). There is a park and monument in South Korea honoring his victories. 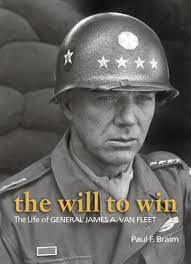 General Van Fleet recognized in the Korean people the characteristic he most admired, and endeavored to create in others – “the will to win”. 1892 James Van Fleet was born in Coytesville, New Jersey on March 19th. However, he was raised in Florida and adopted it as his home. 1911 Van Fleet was appointed to the United States Military Academy. 1915 Van Fleet graduated from the Military Academy with future generals Omar N. Bradley and Dwight D. Eisenhower. During his senior year he played fullback on the undefeated Army team. 1915 on December 25th he married Helen Hazel Moore. The couple had three children, a son and two daughters. 1916 he served as a newly commissioned Second Lieutenant with General John J. Pershing on the Mexican border chasing “Pancho” Villa, one of the most prominent figures of the Mexican Revolution. 1918 he went to France to assume command of the 17th Machine Gun Battalion during WWI where he was wounded in action, after receiving two Silver Stars for bravery. 1919 Van Fleet returned state-side. Between WWI and WWII he was in charge of ROTC programs in colleges and universities. During this time he also coached the University of Florida football team. 1927 he became an instructor at the Infantry School at Fort Benning, GA,. 1944 in January Van Fleet took command of the Eighth Regiment, Fourth Infantry Division. His regiment successfully spearheaded the D-day landing on Utah Beach on June 6th. Van Fleet was promoted to assistant division commander and gained the rank of brigadier general. Soon after became major general and “his division was the vanguard of the Allied counteroffensive in the Battle of the Bulge” (4). 1946 he became deputy commander of the First Army. 1947 he returned to Europe as deputy chief of staff at the headquarters of the European Command in Germany. 1948 Van Fleet was named by President Truman to command US forces in Greece to defend the country against communism. As newly promoted lieutenant general and director of the Joint United States Military Advisory and Planning Group, Van Fleet advised the Greek government and supervised the training of the Greek army, which successfully contained the communist threat. 1950 Van Fleet returned to the US to assume command of the Second Army. 1952 his only son, James, Jr. was reported missing in action during a bombing mission over North Korea. He was declared “presumed dead” by the Air Force in 1954. 1953 General Van Fleet retired from the Army and was given the rank of four-star general. 1957 General Van Fleet was the moving spirit behind the establishment in New York of the Korea Society, the first nonprofit organization in the United States dedicated to the promotion of friendly relations between the peoples of the United States and Korea “through mutual understanding and appreciation of their respective cultures, aims, ideals, arts, sciences and industries. 1984 he endured the death of his first wife, after which he married Virginia Skinner-Higgins Wells. 1992 General Van Fleet died in his sleep at the age of 100 on September 23rd at his ranch in Polk City, Florida. He was buried at Arlington National Cemetery. He was survived by his two daughters and eight grandchildren, one of whom (Joseph McChristian) is currently president of the Van Fleet Foundation.